With Chanukah starting in 8 days and Christmas 25 days from today, it's time to get serious about shopping for your friends and family. Below are some of the new vendors added to the Nipclub Holiday Bazaar, which kicks off tonight at 6 pm EST. TW went completely gaga when she saw @dylcat1's Whisker Knits. For some reason, she's a big fan of anything mohair. She's been known to go shopping with her friends and then fight over the one mohair sweater on the rack! 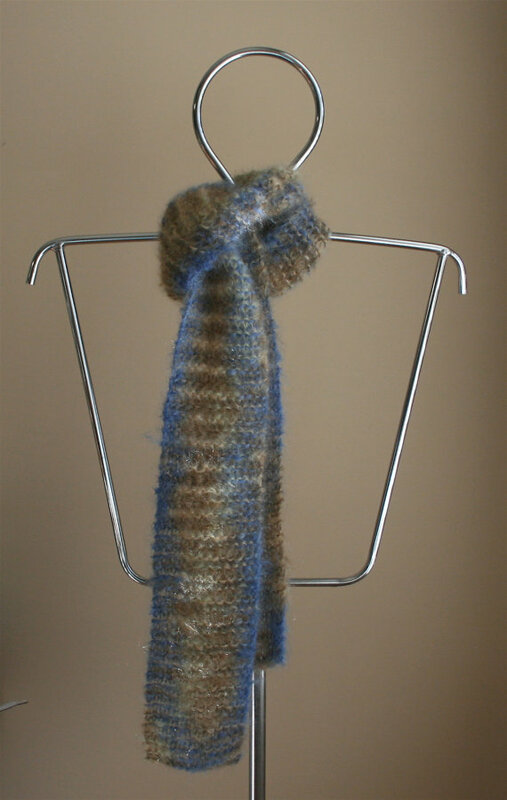 No sweaters here, but plenty of lovely scarves, many made with a mohair blend. The prices are reasonable and 10% of the price is donated to Alley Cat Allies. Winning! You can't go wrong when you shop at the Nipclub Holiday Bazaar. No waiting on lines or seeing that online wheels turning round and round. Even though, tonight is the official kickoff to the Bazaar—from 6 pm EST to midnight—the shops are open. We appreciate everyone who's already started supporting our vendors. They'll be tons donated of prizes. A huge thank you to @KritterKondo, @WinstonTabby, @LittleJack_1, @whskr, @flicka47, @danapixie, @shaynacat, @flacatlady, @Sparklecat, @ColoradoCatnip; @glogirly, @GeorgeTheDuck, @WildHare2634 and @dylcat1. OMC! I may have to stay the entire pawty to try to win something. I KNOW I'll be spending lots of Pop's money. Heh-heh. 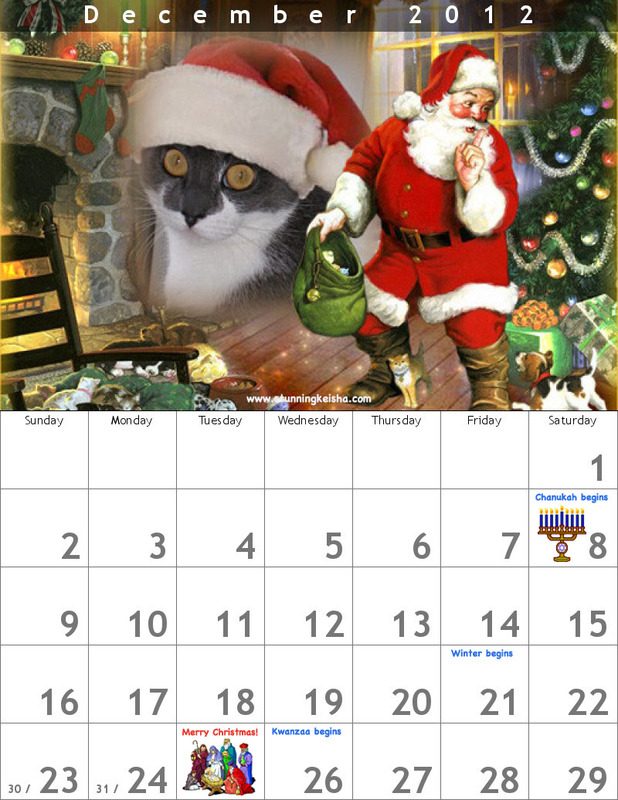 To put you into the holiday spirit, I've finally gotten TW to make my December calendar page and not a day too soon. Maybe a day too late though. Hope it's festive enough for you. BREAKING NEWS: Please vote for my Auntie Pauline's book The Gift of Magic. I believe the voting will last until tomorrow. It's one vote per person/computer. The book is about a hero cat named Trouble, as he tries of save his owner when they become shipwrecked while saving lives at sea. There are FOUR hero cats which makes it a must-read. Your votes are appreciated. The page also has a 5-star review of the book and links to purchase it. Tonight should be a lot of fun!! We hope we can pawtograph some of our books for cat lovers out there! Have a great pawty and have a super Saturday. That calendar is just terrific. I hope all those people sell lots of stuff. Hope you have a terrific week end. I'm sure the pawty will be a huge success! I've been reading about it everywhere and just wish I had some MONEY!!! Grrr... oh wellz, maybe I can finally go back to work in 2013! I am really looking forward to tonight's pawty! BTW, your Auntie Pauline's book sounds awesome! And yes, I voted! ps we have some stars for you! We're so looking furward to the pawty. Mom just voted fur the Gift of Magic, sounds like a wonderful story too! I sure love to shop! But right now I gotta go vote for that book before it's too late! XOXOXOXO Maybe you'd like to come for a ride with me? I'll come pick you up and we'll go someplace nice and warm, my sweet. We LOVE your holiday calendar (and YOU, too), CK.